The Ontario government has betrayed rural municipalities by approving new wind farms in places that have explicitly voted against them, mayors say — including just east of Ottawa. The agency that makes the province’s deals for renewable power is readying a contract for a 32-megawatt wind farm there, one of a bunch of bids from private generating companies it’s just accepted. The other in Eastern Ontario is the biggest of the group, a 100-megawatt project in North Stormont. Both Eastern Ontario councils took votes in 2015 to say they did not want the wind farms on their territories. The province’s Green Energy Act, meant to kickstart an Ontario industry in manufacturing and maintaining renewable energy technology, gave virtually no say to local governments on where wind and solar farms might go. Many rural residents believed, and still do, they’re being sacrificed for the electricity needs of cities. The government pulled back. Under the province’s new rules, municipalities don’t get veto power over renewable energy projects but they do formally get asked to say whether new wind or solar farms are welcome or not. Ottawa’s city council regularly votes its formal support for small solar projects, which is worth extra points when would-be operators submit their bids. “It will be virtually impossible for a wind turbine, for example, or a wind project, to go into a community without some significant level of engagement,” energy minister and Ottawa MPP Bob Chiarelli told a legislature committee in 2013. “We will not give a veto, and no jurisdiction gives a veto, to a municipality on any kind of public infrastructure. That should have been clear to them,” Chiarelli says. Wind farms in rural Ontario are like tall buildings downtown, he says: immediate neighbours may hate them but they’re still needed. Thirteen of the 16 new contracts got local council approval. All of the ones that didn’t are wind farms — the two here and one in Dutton-Dunwich, between London and Windsor, where residents took the issue up in a referendum and voted 84 per cent against. 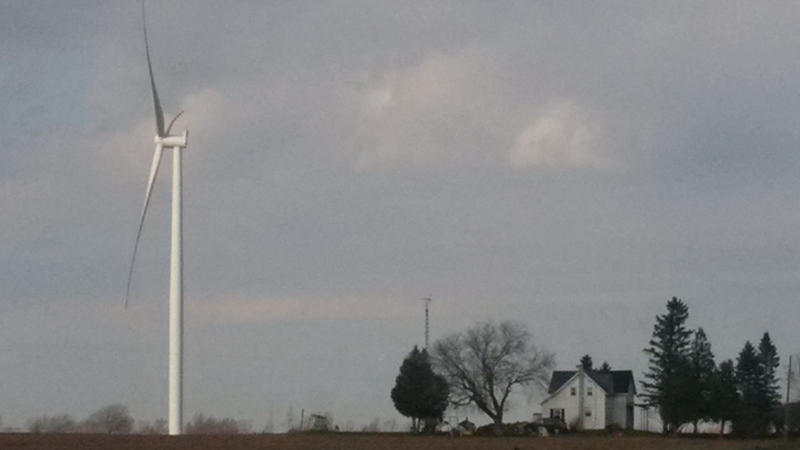 Two wind farms are going to Chatham-Kent, whose council voted to support them. “They’ve put municipalities on the sidelines. It seems, though, that municipalities get most of the grief,” St. Amour says. His council first voted in favour of the wind farm in The Nation without a whole lot of thought, he says, treating it like the solar farms councillors have welcomed in the past. Councillors changed their minds after hearing from residents. “It was rough on council last summer. It was really, really rough. Especially because we can’t do much about it. We thought declaring unwilling hosts was it,” St. Amour says. Mayor Dennis Fife of North Stormont says his council thought the same. “At one time, the government said that if you came out with something saying you were an unwilling host, that would be respected, but that wasn’t the case,” he says. The wind farm in North Stormont, near Finch, will probably have between 30 and 50 windmills. “You’re going to see all of them. There’s the health aspect that people are worried about. Noise, blinking lights, all of that,” Fife says. Let’s work together with all of our might to avoid seeing this kind of action taken in Ontario to defend our rural homes and communities.